Ryecroft Hall was built on land bought from the Earl of Stamford and Warrington by James Smith Buckley in 1849. James, and his brother Able, owned a pair of mills in Ashton-under-Lyne. The Hall is a large L shaped two storey stone built house with basement and attic levels and a slate roof. The entrance porch passes beneath a Tudor arch while most of the windows have two or three lights with double chamfered mullions and transoms and hoodmoulds. The Hall was built to be a declaration of the family's wealth. In 1851 the unfinished Hall passed to James Smith Buckley's son James. It stayed in the Buckley family until February 1913. The new owner Austin Hopkinson was an engineer who built built the delta works in Audenshaw where he invented and developed a coal cutting machine. Between the years 1914 to 1918 Ryecroft Hall served as a voluntary Red Cross Hosptial with over 100 beds. The Hall was also a communications centre; evidence of this remains on cellar doors and the existence of the map table. 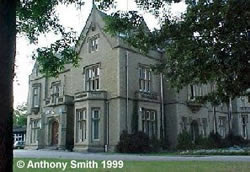 When the Hall and grounds were given to Audenshaw in 1922 it became a social centre for the urban district and so it remained until the formation of Tameside MBC in 1974. It is still used by small groups and as a venue for dance and exercise classes and as a venue for the solmisation of marriages. Ryecroft Hall, now grade 2 listed building, is the site of two Blue Plaques; one for Austin Hopkinson, MP for Mossley between 1918 and 1945, the other to commemorate Harry Norton Schofield, the son of a local chemist who was awarded the Victoria Cross for his part in the Boer War. The room was set up with three big trestle tables, the sort where six people can easily sit to down each side, two side by side and the other across the end of the two. Spanning the two side by side tables there was a movement sensor. At the head of the table was a skull, a crystal ball a black candle and a white candle. There was also a circle of tea lights on the tables. It looked really spooky once the lights were turned out. Everyone sat around the tables, little fingers touching the little fingers of the people on either side of us. We were instructed not to break the circle no matter what happened. The spirits were asked to come forward and to let us know of their presence by knocking or tapping somewhere in the room. At first nothing happened, then we weren’t sure if some shadows were moving and if we could hear footsteps as if someone was walking along one side of the room. Then suddenly the movement sensor flashed. Then flashed again. While everyone was watching the sensor the crosswise table began to rock. It was only a little movement, from one side to the other then from one end to the other. The movement sensor flashed crazily for a few moments then the crosswise table moved, really moved. Many of the people it moved toward screamed as the table shot a good twelve inches in their direction. I thought some one had pushed it but no one had broken the circle of hands but the movement was smooth as if the table was gliding. The table then moved back to its original position without juddering or scraping along the floor. A few moments later the table moved again, this time in the opposite direction, toward me, again there was no juddering or scraping sounds and no one had broken the circle before returning to its original position. After the séance was over several of us tried to move the table by resting our hands on top of it and pushing with our fingers as anyone on that table in the circle would have to have done; we couldn’t make the table move without really pushing down so hard that other people would have been aware of it being a deliberate push. We certainly could not move the table anywhere near as smoothly or soundlessly as it moved by itself. Furthermore, for the table to move in both directions it would have required more than one person at different ends of the table working at a team to get it to move like it did and I know I knew no one at the other end of the table.